. : Is this really a bike lane? Is this really a bike lane? This morning I had an interview in Cedar Park and decided to tool around the surrounding neighborhoods when lo and behold I spot a DEDICATED BICYCLE LANE. At first blush, I was impressed that Cedar Park was so progressive but as I "progressed" further along, I began to get a sick feeling in the pit of my stomach. I started noticing all the cars that were parked in the "lane" and also all the trashcans. Although the lane was marked properly with the cute little image of a bicycle, it's not really being used as one. Instead it's off-street parking and a spot for the trash service to leave the trashcans after they've emptied them. 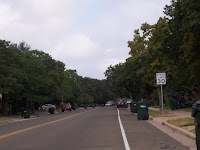 I went home and researched the ordinances regarding parking and bicycle lanes and found that the City of Cedar Park does indeed have an ordinance that states that at all times, parking on the street is prohibited if obstructing a designated bike lane. However, as you can see from the photo above both lanes are being obstructed by several parked cars which suggests that the ordinance is not enforced. Which begs the question... Why isn't it being enforced? The dangers are obvious. Cyclists are forced to share the road with cars which leads to accidents. I saw a couple of cyclists in the few minutes I spent on the street. I saw them weaving their way around the cars and trashcans. Luckily there are alot of stop signs on the street that ensures that cars drive slowly. But still. It totally defeats the purpose of having a dedicated lane doesn't it? Why spend all that money to create the lanes if you can't recoup it by enforcing the LAW and issuing citations? And if cyclists were to raise hell about it they would probably be met with the same resistance that Austin cyclists fought just last month on Exposition Boulevard. The residents will cry about the lack of parking for guests who visit them occasionally (even though each home has a garage and wide driveways as well as other parking opportunities on cross streets).